I made some progress, added the cheeks and the jaw. It needs some corrections, and I do have to make the face more round, because when I mirror it, she looks like E.T.. I follow the tutorial step by step, and it makes things very easy, even on the harder parts. Next, I'll insert the pointed tuft of fur in the cheek. No tutorial for that, so I'll have to improvise. in your ref image the bunny looks mad. Why why WHY did you have to do this to me? She is supposed to be a cat. Now I can't see her as anything else but a bunny! And I drew her, for Pete's sake! Seriously, she is supposed to look tough in the pic, but I want to animate her later on, so I need her face to be neutral for the model. Looking better every time you post. I'm not good at that kind of modeling so I can't give any tips. I'm more of a box-ish modeling guy. You're using the Joan of Arc tutorial? Good to see youre still on top of this! Making good progress.. You might want to fix the cheek a little bit though, yes that horizontal line is a bit out of place Hope you can find a way around it. Keep it up & keep us posted! looking good. Yup! Still at it. I told you I work really slowly. Not a particular reason, though, I'm just lazy. I tried to make the nose, but the Joan of Ark Tutorial proved useless when you try to make a cat's nose, so I'll leave it for now and try to improvise when the time comes. So I made the mouth instead. It would have been ready a loooong time ago, but every time I tried to move some points in the mouth to make micro-adjustments Anim8or crashed for some reason, destroying a long hour's work and shattering my nerves. I made it, though, after many tries, and now Lila has a mouth. I would say it's a bad thing to be one of the first to give to a female, but she still has no voice, so we're safe. I also tried to round her face a bit, but it still needs some work. Still needs many fixes. Working with just one reference image is hard, especially when you are a beginner like me. Also, I still see her as a bunny, even though I made her based on my cat! Well, I'm glad you are still working on it. I had forgotten about this project! The new screenshots look great. Show us some more progress soon, k? I made some corrections. It still needs some more, but only minor this time. Next thing I'll do is to complete the skull and the neck, and the easy part will be done. Then I'll have to do the nose, the pointed tuft of fur in the cheek, the ears and the hair. I just patched up the nose, to start working at its details with extrusions to make it a detailed cat's nose. I tried a few things, but it is more difficult than I imagined, and I'll leave it for later. I intend to extrude the upper "line" of the current nose, and start making a T-shape. 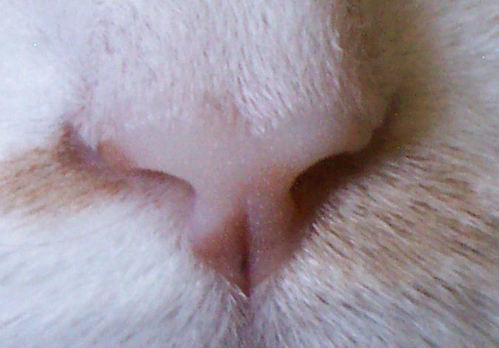 If anyone has a better idea or an advice about the cat's nose, it would be appreciated. I also tried to make a Subdivided render to see how it looks. ...And a mirrored one. For some reason, the "Merge Points" function didn't work. Hi Kain - Good looking work. If merge points doesn't work, it's normally because your trying to merge points on separate meshes. You need to select both halves and choose 'Build' > 'Join Solids' first, then use the merge points. Might not be the problem in this case, but it always used to catch me out. it looks good to me, (that nose kind of scared me, lol) I think it will look good once you have the ears on and maybe some fur. Pretty good start Kain. As Mills said you may have to join the meshes. But you'll have to convert it back to mesh before you can join solids. Just make sure to set subdivision to zero to preserve your un-subdivided frame before converting. As to it looking like a bunny, this happens from time to time. Sometimes some designs don't translate to well in 3D and wind up looking like something else. 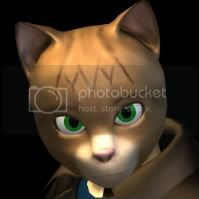 Heck my first cat character looked(still does actually to an extent) like a fox. If you trust your reference image just keep going. Sometimes it solves itself as you near completion. u might want to have the mouth open. i think it will be easier to have that as a base for when you go to do some morphs on it. it already looks good while its closed so it shouldnt be too hard to open it up a bit. about your reference pic. the more you work on it the more it will look like the reference. but it doesnt have to be exactly the same. and since the reference is really basic its only going to kind of look like it anyways. your doing really good so far. so just keep plugging away at it and youll get some good results. Thanks everyone, that was the problem, I tried to connect the meshes before joining them. I'll try to remember it. I have almost finished modelling the head, and soon I'll post some new screenshots. Right now I only have to do some details, the nose, and put them all together. I already made the ear in a seperate file, and I think I'll make the nose the same way, since it's impossible for me to do it with extrusions. The purpose of this post, though, is to ask some questions. First of all, does anyone know where can I find hairgen.zip, a hair generator for Anim8or? The link I have does not work at all. Also, if I manage to find it, do you think it would be better to use this for Lila's hair, or should I use another method? Secondly, as you can see at the sketch to the first post of the topic, Lila is wearing a Karate-gi and a sweater, both very loose, which means they'll have to wave when the character moves. Can Anim8or actually do that, or will I have to do it manually? you could use either morph targets or when building your figure make seperate bones branching off which connect to the waving parts. Nice work so far! Automated like cloth simulation: No, sadly. Davidud already summarized your options so far when it comes to trying to fake the loose clothing. Will take some planning for both methods. I'm still at it, although I go really slowly. I finished the core head and the ear, now I just have to do the nose, hair and body. The nose has proven itself to be the most difficult thing in the history of ever, so it will take some time and a LOT of effort to be done. I have not decided yet about the size and placement of the ear, since when I placed it according to the reference image the cat looked like a donkey. Also, it's really difficult to connect the ear to the head. I still have not found the hairgen, and I don't know which would be the best way to make the hair and the cheek: With the grassgen, with the hairgen if I ever find it, or as carefully textured solid objects? The side view is awkward. Maybe it needs a few minor corrections. The ear is modeled after a real cat's ear photo. It may be too realistic for my model, but I'm not sure if that's the problem with it... It just seems out of place, somehow. I finally learned to draw sideviews of my characters, so the next one will have two reference images, and therefore be a lot easier. Wow, I was hoping you'd finish that head one day! It looks great, really. Be sure to post more when ya got more.